This Fast Battery Carger charges an empty battery in 4 hours whereas the standard charger takes 11 hours. This is a great accessory for your Spinfire Pro 2 if it is under heavy use and you want your machine at optimum performance. The maximum speed available will slowly trickle down as the battery flattens, therefore it is recommended to keep your machine as fully-charged as possible. You can also plug this fast charger into the machine while it is being battery operated and it will charge the battery at a faster rate than it is being drawn. 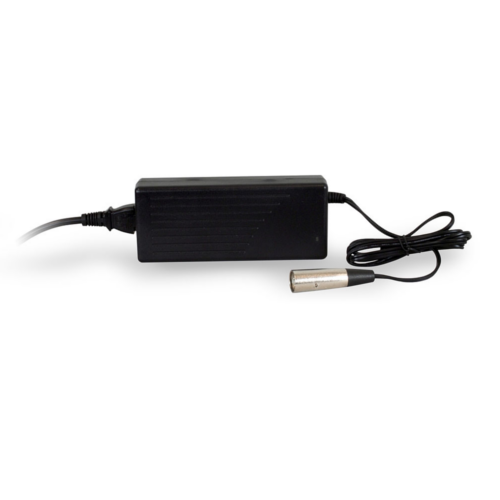 In this respect it acts as an AC Adapter and your machine will never run out of battery power while the battery is connected to the fast charger. However, there must be some capacity left in your battery for this to work. The Fast Charger which will not damage your battery if left on too long as it is a smart charger.